Your name is no accident. 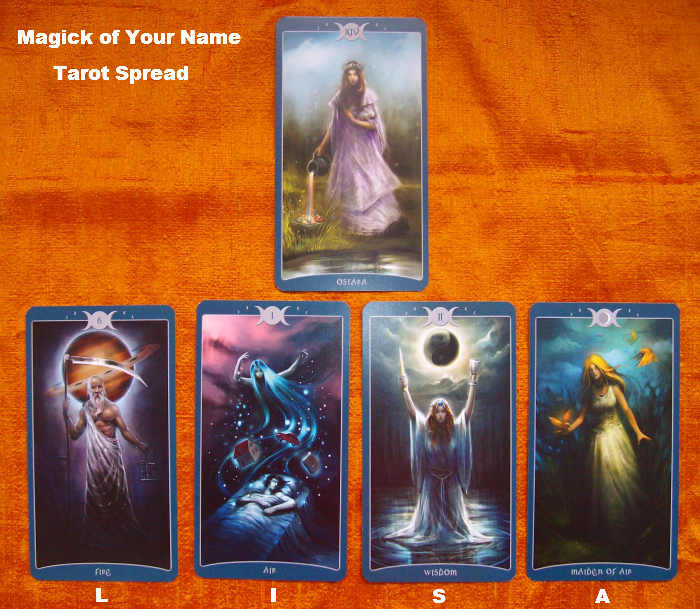 There is magick in your name that you can harness with this Tarot spread. Reduce any number greater than 22 to a number between 1-22 to correspond to one of the Major Arcana cards. Place the corresponding Major Arcana card at the top of the table. This Major Arcana card corresponds to your life purpose. The next step is to choose a quality that you wish to embody for each of the letters or your name. Pull a card for each of these qualities and place them below the Major Arcana card that corresponds to your name. Contemplate how each of the cards mirror or challenge the expression of the qualities you chose to embody. Contemplate how each of these cards relate to the Major Arcana card and your life purpose. 6 of Fire and Saturn speak of integrating Masculine/Father energies at the heart level. 1 of Air shows me what I already know – Inspiration is my forte. A steady flow of ideas from an infinite source… and I often wake up knowing what to write about. II Wisdom. My self-confidence is intimately tied to the work I do and my spiritual calling. When I’m on my path, nothing can rock my confidence. Maiden of Air… Too many ideas perhaps. There is a need to focus on that million dollar idea. The work I do is all about Healing and Temperance is the main healing card in the deck.